Historic haunted homes appeal to those interested in history, the paranormal, and architectural period styles. It's not unusual to find resident ghosts in historic houses, especially when many generations have lived and died there. You can find haunted historic houses all across America in city and rural settings. Setting out to explore these ghostly old houses can be an exciting and sometimes scary adventure. Most haunted homes have a cast of ghosts that often take visitors by surprise. One common apparition is the spirit dubbed the Lady in White or Lady in Pink. These spirits are oftentimes the former mistresses of the homes or in some cases women who met untimely, tragic or mysterious deaths. This two-story, Greek Revival house was built on land that had previously been a cemetery. It was also the site of a hanging. Thomas Whaley purchased the land, built a home and operated a general store out of the first floor. After he moved his family to San Francisco, Whaley rented the house to a theater troupe and later to the county for a courthouse. 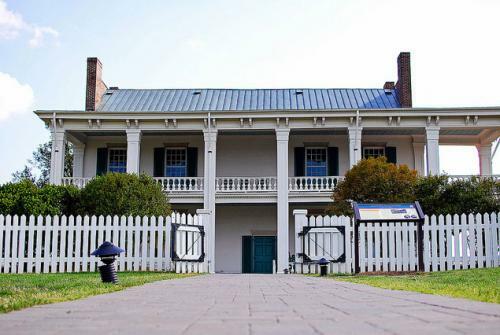 A well-preserved example of Greek Revival architecture, this two-story home of John and Carrie (Caroline) McGavock is located in Franklin, Tennessee, where one of the bloodiest Civil War battles was fought. The Battle of Franklin began at sunset and lasted five hours into the night, leaving over 10,000 Confederate and Union soldiers dead. The mansion was used as a Confederate field hospital and the floors in several rooms were left permanently bloodstained. The family also donated land only a few yards from house for a cemetery to nearly 1,500 soldiers. It's no wonder that this home and the surrounding grounds make it one of the most-haunted historic homes in America and the most-haunted home in Tennessee. Eyewitnesses claim Carrie McGavock, dressed in a pink flowing gown, wanders the plantation. The Grove is an 1861, one-story, Greek Revival house. The current owners have renovated it and are very knowledgeable about the different construction periods of room additions and renovations. You can take a guided tour of the home with the owners, Charles and Daphne Young. You might catch a glimpse of the resident ghost, the home's original owner, Minerva Stilley, who walks through walls and moves about the home. This Victorian home is filled with dead-end staircases and doors that lead nowhere. If you can see beyond the eccentricity, you'll find 160 rooms in what was a very modern home with heating systems, sewer system and several elevators. Sarah Winchester, heiress to the Winchester rifle dynasty, was told by a medium that the only way to mollify the restless spirits who had died from the Winchester rifle was to continually build onto her mansion. 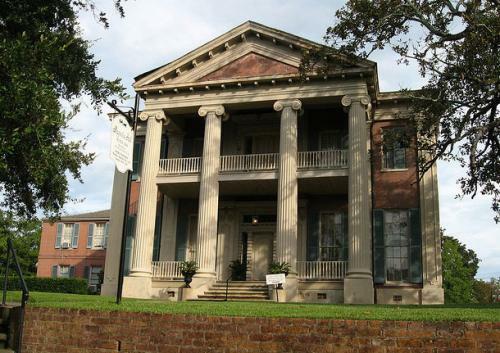 Another excellent example of Greek Revival architecture is the mansion known as Magnolia Hall located in Natchez, Mississippi. This home is said to be haunted by the original owner, Thomas Henderson, who died only five years after moving into the home. In addition to his ghostly apparition, tour guides and visitors have noticed indentions in bed pillows and have experienced times when the lights turn off and on with no apparent cause. Built in 1732, the General Lafayette Inn and Brewery, located in Lafayette Hill, Pennsylvania is said to be haunted. St. Peter's Church is only a few feet from the Inn where a bloody battle ensued between the British and Lafayette's men. The British were defeated, but the ghosts of both the British and Colonists still haunt the premises. The most confounding story involves two wait staff, who attempted to move a chair when preparing to close for the night. The two women claim the chair couldn't be moved. They stated that it felt as though someone was sitting in the chair. Other occurrences include doorknobs turning and rattling, phantom footsteps, slamming doors, a chair spinning on one leg, and various apparitions manifesting in the inn and brewery. You may be surprised to learn that the Capitol of the United States of America is haunted. This federal style home of the President is said to be haunted by past presidents and other well-known historical people. In fact, it's probably the most documented haunted house on record. First Lady, "Dolley" Madison appeared to gardeners, who were attempting to dig up her rose garden and admonished them. The Rose Garden renovation was abandoned and remains today as it was when Dolley had it planted. President Calvin Coolidge's wife, Grace, saw Lincoln's ghost in the yellow oval room as have numerous White House employees. First Lady, Mary Todd Lincoln saw the ghosts of Thomas Jefferson and John Tyler. President John Adams and his wife, Abigail have been seen. First Lady, Eleanor Roosevelt saw Lincoln's ghost. 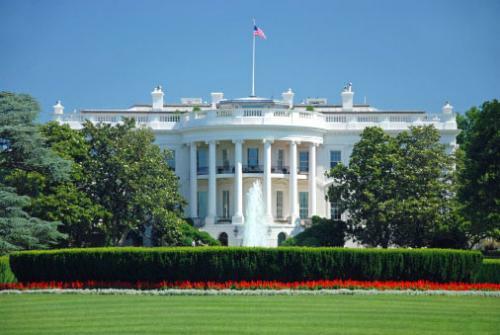 President Truman wrote about hearing the ghosts move about the White House late at night and various knocks on his door. The Netherlands' Queen Wilhelmina was awakened by a knock on her door and found Abraham Lincoln standing in the hallway. Many have heard Andrew Jackson laughing or cursing. Witnesses include, First Lady Mary Todd Lincoln, White House employees, and President Lyndon Johnson. Winston Churchill refused to sleep in the White House after encountering Abraham Lincoln's ghost one night. As you can see, there is no lack for haunted historic houses to visit. 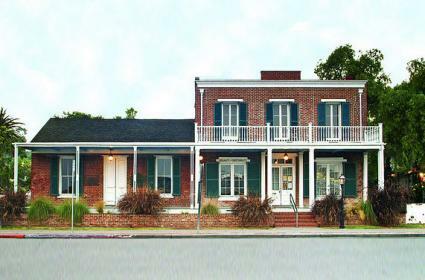 Many are open to the public either as museums, or as lodging, restaurants, and more. So head out on the highway to find plenty of historic haunted homes you can visit and maybe experience a ghost.